No, it's not a special milestone anniversary for Martin Scorsese's classic drama Taxi Driver, but the Alamo Drafthouse is just cool enough to have two special screenings of the film on Wednesday, March 20th. The film will be presented as 4K digital restoration, which Scorsese supervised himself. But that's not the only thing that's special about these screenings. 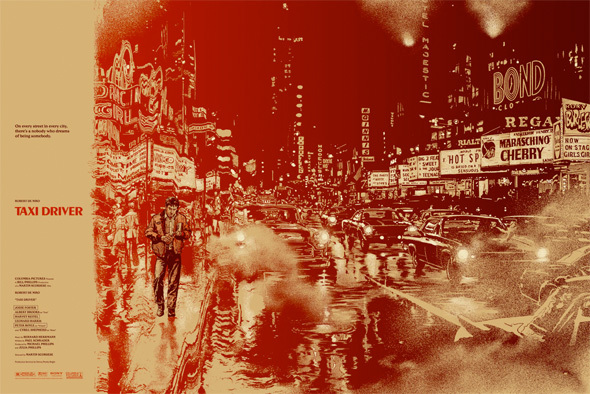 At both of these screenings, and only at these screenings will you be able to buy a fantastic new poster from Martin Ansin. It's a bit busy, but still a gorgeous piece of work featuring Robert DeNiro as Travis Bickle and the bustling streets of New York City. Check it out! It's cool how DeNiro is the only thing not warped on the left side. If you get a chance to attend the show, it's one poster per person, and it doesn't sounds like there will be any sold online afterwards, but don't quote us on that. The screenings are at 7pm and 10pm at the Alamo Drafthouse in Austin, Texas, so if you're in the area or feel like making the trip for this great film and a cool poster to purchase, then go and enjoy yourself!